Wrap thawed spinach in several layers of paper towels and squeeze out as much water as possible. Place dried spinaach in medium-sized bowl. Add sour cream, mayonnaise, vegetable soup mix, water chestnuts, red onion and worchester sauce. Mix well to combine and let sit in fridge for at least 1 hour. Taste the dip and add salt and pepper as needed. Serve with dippers of your choice. We like it with buttery crackers, pumpernickle bread, tortilla chips, pita chips, carrot sticks and/or melba toast. In a large saucepan with a lid, cook bacon strips over medium-high heat until crispy. Remove strips to drain on paper towel, leaving the bacon grease in the pot. Reduce heat to medium. Add 1 tablespoon butter to the bacon grease and melt. Add onion and cook over medium heat until translucent, about 4 minutes. Add garlic and cook and additional 1 minute. Reduce heat to medium-low. Add spinach leaves and cover pot. Let cook 2 minutes or until spinach is partially wilted and remove from heat. 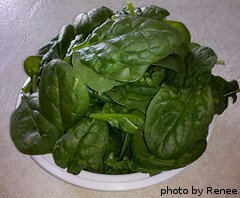 While spinach is wilting, melt remaining 1 tablespoon butter in a skillet over medium heat. Sprinkle flour over melted butter and whisk until smooth. Gradually stir in half-and-half and whisk so that no lumps form. Simmer until thickened slightly. Season sauce with salt and pepper. Pour sauce over wilted spinach and mix until coated. At this point, spinach should be completely cooked. If not, cook over medium low heat until done. Stir in parmesan cheese and nutmeg. Pile into serving bowl and crumble bacon over the top. Serve immediately. In a medium bowl, mix together sesame seeds, sunflower seeds, poppy seeds, sugar, oil, vinegar, paprika, garlic powder and red onion. Cover and let sit in fridge for at least 1 hour. In a large serving bowl, combine spinach, strawberries and almonds. Pour dressing over spinach mixture and toss to coat. Serve immediately. Add olive oil and butter to skillet over medium heat. When butter has completely melted, add garlic and cook until it barely starts to soften. Add spinach leaves and cook until halfway wilted, stirring often. Remove from heat and pile into serving bowl. Toss with salt and serve immediately. Place pie crust into pie dish and use fork to prick the bottom several times. Place in oven and blind-bake for 10 minutes. Remove from oven and put on cooling rack. Leave oven on. While crust is baking, add butter to a large skillet and melt over medium heat. Add garlic and onion and saute for approximately 3 minutes until translucent. Add spinach and mushrooms to skillet and cook 2 minutes. Add cream cheese and 1/2 cup cheddar cheese and continue cooking until spinach is completely wilted and cheese is melted. Remove from heat and pile spinach mixture into pie shell, spreading it out evenly. In a small bowl, whisk together eggs, milk, salt, pepper, paprika and cayenne. Pour into pie shell over spinach mixture. Bake in preheated oven for 35 minutes. Remove and sprinkle remaining cheddar cheese over the top. Bake an additional 15 minutes until quiche is set in the middle. Let stand 10 minutes before serving. In a large pot, bring water to a rolling boil. Add salt and linguini and cook 11 minutes. When al dente, drain pasta, return it to the pot and set aside. While pasta is cooking, melt olive oil and butter together in a large skillet over medium heat. Add garlic and cook for 1 minute. Add white wine, lemon juice, shrimp and spinach leaves. Sautee for 3 minutes, turning shrimp at least once. When done, the spinach should be wilted and shrimp should be slightly pink. Pile shrimp mixture into the pot with the pasta and toss to coat. Stir in lemon zest, red pepper flakes and salt. Toss again and serve immediately.